Jim Ryan/Special to The Aspen TimesThe Skiers' Will Bloemsma, left, and McCall Kauss defend Rifle's Fernando Carreon on Thursday night at Aspen High School. ASPEN – It’s hard to lose track of 6-foot-8 Bridger Dawson, but the Rifle defense did just that on the opening possession of the fourth quarter Friday night. All alone in the near corner, the Aspen senior pulled up for and drained a 3-pointer, stretching the Skiers’ lead to nine at 31-22 in this battle of 3A Western Slope foes. The basket sparked an 8-0 run that all but put the game out of reach. Aspen converted from the foul line down the stretch to pull out a 49-39 win – its sixth straight and eighth in its last nine games to close out the regular season. More important, the win helped the Skiers (12-7 overall, 9-4 conference) break a four-way log jam with the Bears, Coal Ridge and Roaring Fork atop the Slope’s North division standings. Aspen can finish no worse than in a tie for first place and are assured a home game in next week’s district tournament – quite a feat considering it lost three of four to open league play. “Wow, that was exciting,” beaming Skiers head coach Steve Ketchum said. “I truly believe Rifle is the best team in the league, talent-wise and skill-wise. … When you beat quality teams like Roaring Fork or Coal Ridge or Rifle and Grand Valley, who is state ranked, you can beat anybody. 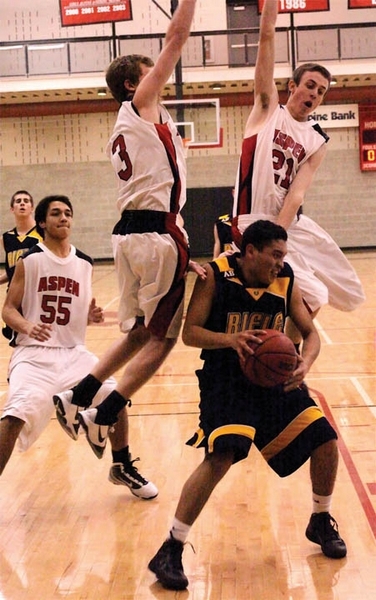 Aspen squandered a 15-point lead the last time these two squads squared off Jan. 15. This time around, the Skiers utilized sound defense to finish strong. Aspen threw a mix of man-to-man and zone at Rifle, surrendering just four points in the third quarter. Dawson, who scored just 11 points in the Skiers’ previous two games, provided the offensive spark. He banked home a runner, then scored off an inbound play midway through the third quarter, giving Aspen a 28-20 lead. He opened the fourth quarter with a 3-pointer. Quinn Morehead followed with another 3 and a lay-up to give the Skiers their largest lead of the game at 36-22. The Bears (9-9, 8-4) countered with eight consecutive points in little more than 90 seconds to pull to within seven. Rian Creech scored twice in the paint and Fernando Carreon pulled down an offensive rebound on a missed free throw and scored during the stretch. Creech finished with 14. With about 2 1/2 minutes remaining, Dawson pushed the Aspen lead back to 10 when he absorbed a bump and scored, then finished off a three-point play from the foul line. He scored 12 of his game-high 17 in the final half and also pulled down seven rebounds. In an effort to extend the game, Rifle began fouling often down the stretch. The Skiers converted 8-of-10 from the stripe in the final 2 minutes. Aspen likely will host a district tournament opening round game Tuesday. Rifle, meanwhile, closes out the regular season Saturday at Roaring Fork. Tip-off is slated for 4 p.m.
Aspen’s prime objective in Thursday night’s game with Rifle was to contain Bears guard Cortney Cordova. The Skiers succeeded on that front – they routinely double-teamed Cordova, holding her to six points, about 15 below her season average. But Rifle’s other weapons made Aspen pay early and often. The Bears went on a 14-2 run during a three-minute stretch at the end of the first and beginning of the second quarters, turning a four-point lead into a 22-8 advantage. The state’s fourth-ranked team led by 17 at the half and, on the strength of a dominant fourth quarter, routed the Skiers, 71-33. Rifle has outscored Aspen, 141-66, in two meetings this season. Guard Makayla Wilkins connected four times from 3 and finished with 16 points for the Bears, who improved to 18-0 overall and 12-0 in league play. Teammates Tresa Berner and Rachel Keithley controlled the paint all night and combined for 24 points. Bailey Everhart finished with 15 and Jonelle Berklund added 10 for Aspen, which fell to 5-14 and 3-10 in the Slope. The Skiers will host Roaring Fork at 6 p.m. Monday in a district tournament play-in game. Rifle closes out the regular season against Roaring Fork at 2:30 p.m. Saturday in Carbondale.